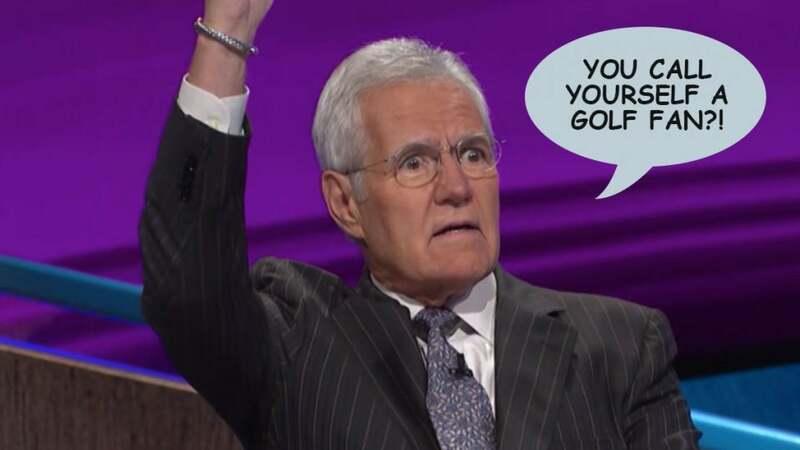 11 really hard golf questions that appeared on Jeopardy! 11 really hard golf questions that have appeared on Jeopardy! Alex Trebek, in his 35th season as Jeopardy quizmaster, is not easily impressed. Most of the golf questions that have appeared on Jeopardy! — there have been more than 800 in all — would be a snap for the golf-mad users of this site. (Take, for example, this softball from a show that aired last June: Like New Orleans, golfer Ernie Els has this nickname. Come on, Alex, challenge us!) But every so often the show’s writers do cook up a doozy. Here are 11 golf-related questions (to be fair, a couple are really loosely related) that might stall you, if not outright stump you. Answers are below the final clue. Good luck! Tiger for $500, please, Alex: An unauthorized history of golf on Jeopardy! MILITARY NICKNAMES & SLANG / $1200 This term for an unidentified aircraft or missile is also used on the golf course CONTRONYMS / $1200 An advantage in golf or a disadvantage through lack ENDS IN DOUBLE LETTERS / $2000 Tiny, sharp teeth give this plant its name, also an elite Florida golf course SPORTS / $400 This last name of golfer David is applied to what he called a "correction shot" AMERICA'S GOT TALONS / $1000 A golf tourney was the scene of a catch made by this seabird, also the name of a tiltrotor hybrid aircraft SHARP (& FLAT) INSTRUMENTS / $1200 An old joke says that golf was invented by the same people who think that music comes out of these GOLF / $300 Golf ball covers are usually made of this ADVERTISING / $500 Slogan created in 1921 when a pal of an R.J. Reynolds adman ran out of cigarettes on a golf course GOLF TALK / $300 "Stretcher Bearer" is a slang expression for one of these golf helpers SPORTS HISTORY / $600 Rudyard Kipling painted golf balls this color to find them on snow-covered "greens" in Vermont ENDS IN "SS" / $200 Golfers know it means to lay the club behind the ball in preparation to hit it (not mail it) ***** Answer key, from top: What is a bogey?, What is a handicap?, What is Sawgrass?, What is Mulligan?, What is an osprey?, What are bagpipes?, What is a vulcanized rubber compound?, What is “I'd walk a mile for a Camel", What is a caddie?, What is red?, What is address?